It’s sad to think that old cemeteries get tossed by the wayside, covered with dust and weeds, and forgotten to history, but it isn’t uncommon. Over the course of time, people move on, descendants forget, and life goes on. There are many documented accounts where Civil War soldiers’ remains are accidentally unearthed when construction crews dig up new strip mall foundations, and occasionally, the forgotten cemetery gets unearthed as well. One such graveyard was recently discovered in North Carolina. Near Four Oaks, 20 Confederate soldiers’ graves were dedicated on June 11. The soldiers died during the Battle of Bentonville, in which about 4,200 Union and Confederate troops were wounded or killed. The remains of the 20 Confederates were buried near the Harper’s Farm, which was used as a field hospital. As years went by, the exact location where these soldiers were buried was lost. But thanks to the discovery of a 19th century photograph showing headstones near the Harper family cemetery, as well as 21st-century radar, the graves were re-discovered. The Harper House Chapter of the UDC is in the process of raising funds to replace the headstones. To honor their Confederate ancestors, seven motorcycle enthusiasts from Maryland began the Mechanized Cavalry in 1986. Since then, the group has grown to a membership of around 1,500. Each year, the cavalry rides out to see different historical locations relevant to the War Between the States. The cavalry donated $2,000 to the museum, obtaining the money by holding a drawing for a custom-made hunting knife. All are members of the Sons of Confederate Veterans. According to Whitt, “We really like riding bikes and we really like Civil War history.” Next year, the group plans to travel to Georgia. For more information, visit www.scv.org. Last Friday marked another interesting anniversary in regard to the Civil War. On June 17, 1861, Thaddeus Lowe demonstrated the hot air balloon to President Abraham Lincoln. His plan was to use it as a reconnaissance tool to spy on the Confederate army. He came up with the plan when, in April, his balloon accidentally landed in South Carolina on a flight from Cincinnati, Ohio. On June 5, 1783, the first documented hot air balloon flight took place. It was conducted by the Montgolfier brothers from Annonay, France. Three months later, on September 19, 1783, the first hot air balloon to fly with passengers took place in Versailles. Those brave souls rode in a basket suspended beneath the balloon. A year later, on June 24, 1784, a thirteen-year-old boy named Edward Warren was the first American to ride in a hot air balloon. This event took place in Baltimore. Both the Confederate and Union armies used hot air balloons to spy on each other. Balloons were able to climb up to 5,000 feet. The Union balloon corp, consisting of five balloons, only lasted until the fall of 1861, when it was disbanded. Another interesting fact: George Armstrong Custer, who obtained fame during the War Between the States as the youngest man to achieve the status of general, and later met his demise at Little Big Horn, was one of the first test pilots for the newly-established reconnaissance operations using hot air balloons. Happy Belated Birthday Jeff Davis! 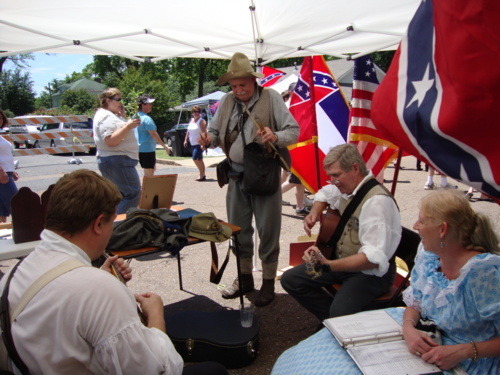 On Tuesday evening, the Sons of Confederate Veterans, Samuel A. Hughey camp 1452, celebrated Jefferson Davis’ birthday (June 3) in Southaven, Mississippi. In honor of the occasion, the camp shared stories about the president, as well as recent travels that members have taken. 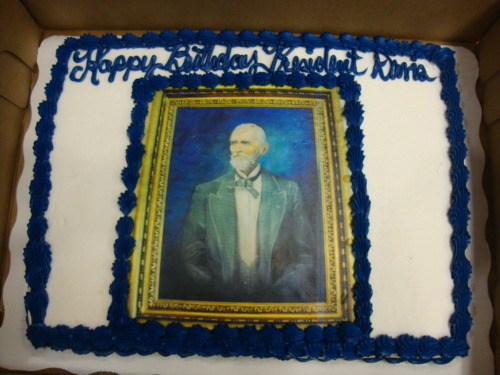 After the meeting, everyone enjoyed barbecue and a cake with President Davis’ likeness on it. Last night, my UDC chapter, Varina Howell Davis #2559, met for the last time until next September. We went through a long list of items that will hopefully qualify us for awards at the upcoming national convention. I don’t know if it is normal procedure to take the summer off, since I’m new to being in the United Daughters of the Confederacy, and new to the south as well. There are still a few events slated to take place this summer, including a birthday celebration for Nathan Bedford Forrest at the Memphis park named in his honor. This event is sponsored by the Nathan Bedford Forrest UDC. Needless to say, I hope everyone has a fun-filled summer full of adventure and happiness. I also hope to see some of you over the course of the summer. See y’all in September! 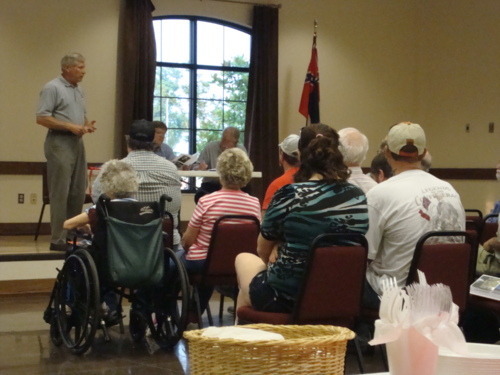 On Saturday, May 21, the quaint little town of Hernando, Mississippi held its annual A-Fair. 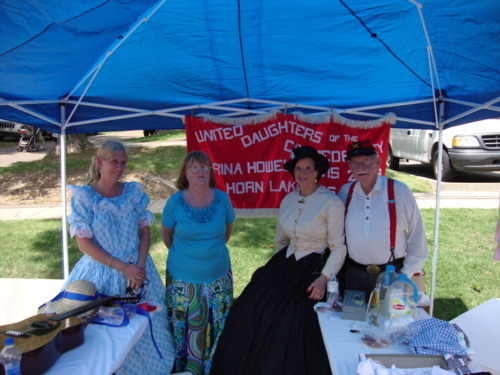 This year, members of the Varina Howell Davis #2559 United Daughters of the Confederacy were there to sell their wares. 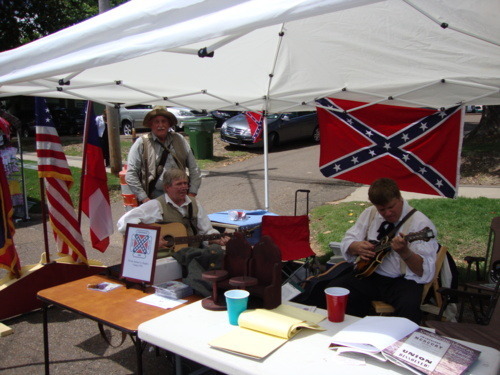 At an adjoining tent, the Samuel Hughey camp Sons of Confederate Veterans was also represented. This is usually an opportunity for the local SCV and UDC to recruit new members, inform people about what we do, and sell homemade crafts and food. It is a really fun way to meet the public and spend time with fellow members.